Two Merck Insiders (Virologists) say MERCK has been faking vaccine data for over a decade. 7. Gardasil and its boosters contain Sodium Borate, a carcinogen. It is used as a common roach killer and is also known to cause seizures, unconsciousness (both common vaccine reactions), and death. 8. Vaccines and Related Biological Products Advisory Committee (VRBPAC) back in May 2006 revealed that when the vaccine is administered to a woman with a dormant or harmless form of HPV, the virus can become activated, increasing the likelihood of precancerous lesions developing by a whopping 44.6 percent. That means Gardasil can cause cancer to develop. 9. Merck openly admits that they don’t know if Gardasil will actually prevent cancer at all. After all, the incubation period for cervical cancer is 15-20 years. Merck knows the vaccine is only good for 5 years at most. That means a booster shot will be needed every 5 years — many more injections of chemicals which are proven to cause infertility and cancer, but unproven to stop cervical cancer. 11. In addition to seizures, unconsciousness and death, Gardasil has caused facial paralysis and Guillain-Barre Syndrome (body’s immune system attacks part of the peripheral nervous system). 12. The FDA reports “Thromboembolic disorders (blood clots) have been reported to VAERS in people who have received Gardasil.” These clots, many fatal, occurred in the heart, lungs, and legs. Do your research. Google “Gardasil deaths” or “Gardasil adverse events” Read about the girls who are no longer with us or who have become disabled because of Gardasil – the HPV vaccine. Pass this information on. Merck wants profits. Politicians want campaign money. We want our healthy and beautiful daughters back. Just say NO to the HPV vaccine. 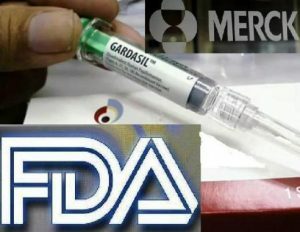 If you know someone who has been hurt by Gardasil, have them research the class action law suits against Merck.